Encouraged by Michael Manske’s post at carniola.org featuring Hollywood ignorance of a particular source of Slovenian pride and joy, I thought I’d write a post about the graceful creatures of Lipica that gave them their name, though the world is most familiar with them as the equine version of ballet dancers admired at the Spanish Riding School in Vienna. The Lipizzaner breed of horse, which is among the most ancient ones in the world (the absolute record being held by the unbeatable Arabian horses) and goes back over half a millennium, is the product of sturdy local Karstic mares, refined by the introduction of “warmer-blooded” Spanish stallions and later on by an Arabian stallion as well. Horses of the Karst had a reputation for resilience and speed even back in ancient Roman times. In 1580, the first Andalusian stallions arrived to the new royal stud farm at Lipica (Southwest Slovenia), built by Archduke Charles, the third son of Ferdinand I of Habsburg. During the Napoleonic Wars, the stud farm was forced to move three times to Hungary, and sought refuge near Vienna during World War I. It took a great effort and dedication to rebuild the stud farm after WW II. Of the founding stallions, two were brought from Kladruby in Bohemia (Favory and Maestoso), two from Naples in Italy (Conversano and Neapolitano), one from Frederiksborg royal stud farm in Denmark (Pluto) and one directly from Arabia (Siglavy). Lipizzaner mares come from 16 different families. After careful selection through the centuries, the resulting breed is of medium size, standing at about 15 hh. The lively eyes reveal the horse’s intelligence. The well-muscled neck is set rather high and decorated with a thick, but silky soft mane. Its legs are strong, with well-developed wide joints, ending in strong, small, well-formed hooves. Correct body structure produces the characteristically impressive gate. The high, elegant, energetic, proud gates make the breed the perfect choice in parades. 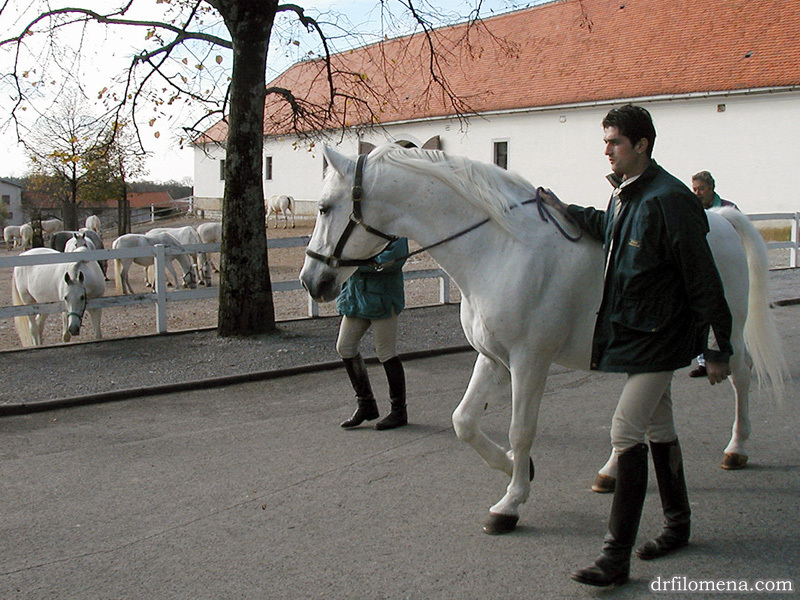 Although best known as the white horse of the Karst (or of the Vienna riding school, for that matter), Lipizzaners do also come in black and bay. Some breeders specifically specialize in those colours. As is the case in other breeds, the horses that turn white are all born as black, bay or chestnut foals, changing colour later on. Thanks to selective breeding, white Lipizzaners usually turn completely white very quickly. One thing to remember here: white is not a colour, it is absence of colour. Any white horse (or cat, or dog) has a genetic code for a “real” colour, which is overrun by a gene or set of genes that suppress pigment production or cause pigment degradation. Lipica maintains a top level breeding programme placing great emphasis both on health and performance. All the moving around that the horses were forced to endure while the world was at war decimated the herd, narrowing down its gene pool and the resulting inbreeding nearly caused the famed sturdy horse to lose its reputation for longevity. At Lipica, they are enforcing a strict 5-generation rule under which no two horses with a common relative in the first five generations of ancestors may be bred together; accordingly, the stud farm has been exchanging stallions that meet the same tough selection criteria with other breeding centres. This policy has proven to be highly successful and the white horses of Lipica can again boast excellent health and longevity. Over the last 20 years or so, attempts have been made to modernize the Lipizzaner breed in order to make it more competitive in modern sports. Competitive dressage and show jumping calls for a different body type than would be required in an 18th Century battle horse. Thankfully, the attempts have mainly been abandoned and the value of the breed as it is has been recognized before they completely ruined it and turned it into a “ne tič ne miš”. The only real Lipizzaners that may have the letter L branded in their cheeks are ones from the Lipica area as their bone and hoof structure is influenced by their nutrition, i.e. the lime-stone-heavy grass and hay from the Karst. Lipizzaners from Lipica (and Piber, the Austrian stud farm with whom Lipica has had the most frequent exchange of ‘genetic material’) tend to be lighter in frame and more elegant than those from stud farms in other European countries where part of the herd had been left behind in war turmoils and the horses were bred differently. In the late nineties, several countries claimed the breed as their own resulting in a political hot potato. Italy and Austria concluded an agreement on keeping the original Lipizzaner studbook records independently of Slovenia, which at the time was not a member of the EU. Incidentally, Italy’s only claim to the breed is the fact that the country occupied south-west Slovenia for a while and took the original stud books from 1926 onwards to Rome at the time of retreat. Most of the older stud books had already been taken to Vienna prior to Italian occupation. In early 1999, Slovenia responded to said agreement by issuing a regulation on the designation of origin and geographical indications for the name of Lipicanec (in all languages) referring to the history of the breed and its specific characteristics related to the area where it is bred. The fight over the original studbook record-keeping – as most issues tend to – comes down to not mere prestige, but money. In this case, EU agricultural funds. Anyway – if you’re in Slovenia, you have no excuse not to make a visit to the historic site that is the true home to these beautiful white pearls of the Karst. Besides taking a stroll and a guided tour through the farm, you can take riding lessons at all levels, go out for a ride in the beautiful countryside, take a carriage ride, watch a classical riding school show (think Vienna here). When you’re all horsed out, you can play some golf or enjoy the casino if that happens to be where you get your kicks from (hey, I’d rather be out there on horseback myself 😀 ). EDIT: Not only would I prefer to enjoy Lipica from horseback or horse carriage, but I really hope that these aspects along with the haute ecole shows remain the focal point in Lipica. The powers that be seem to have lost their bearings and forget what the stud farm is all about. Concerned citizens opposing extension of golf courses on the pasture lands of the white equine ballet dancers have their website at Ohranimo Lipico (Let us preserve Lipica). Well, my best guess would be, that Lipizzaner come from Italy, since they have the word PIZZA in their names. Amazing how white and spotless they are. Hahaha, Luka sid where are you pick out that the Lipizzaner come from Italy. @GRiSON: Yes, it’s all clear now. Italy’s claim to the Lipizzaner is pizza 🙂 another mystery finally revealed. Hey Luka, what about JFK? dr. filomena: That’s easy! JFK was murderd by Merilyn Monroe! Thanks for the lesson about horses. Very informative post. I’ve lived in the Karst near Lipica for more than twenty years and been there dozens of times, but I still learned a lot from reading this. I’m surprised, though, that you didn’t mention the controversy and conflicting interests regarding the expansion of the golf course, or link to the site Ohranimo Lipico . I can’t bear to visit Lipica anymore, it’s too painful seeing the neglect and deterioration of the stud farm, as contrasted with the hideous commercialized development of the golf course and casinos. Golf is a completely inappropriate use of land in these parts, it really makes me sick to see it, especially when it’s encroaching on prime pasturage for Lipizzaners. As for the casinos, they’re spreading like a cancer all over the Karst landscape and beyond. Anything for a quick buck, or in this case I suppose euro. Some Slovenes (in particular many among the ruling elite) appear all too willing to sell their heritage, not to mention their souls, for a profit. Sad. 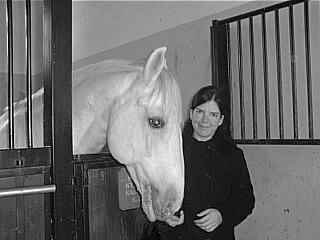 @Quint & Trotter: I’m of course familiar with the gorgeous Lusitanos 😉 but thanks for the link! @Jean: I guess I was trying to be optimistic. I definitely oppose any expansion of the golf course in Lipica. I will include your link up in the text, thank you for the input. Lipica has not been managed very well except for the horse breeding itself and I really hope that the government takes a long hard look at the issues and adopts a responsible decision, not a short-sighted one tailored to the agenda of the few at the top who couldn’t care less about the animals and the cultural heritage. @Pengovsky: Thanks for the idea! @Jean: The added text w/ link is now up. I am very honored to say I have 6 of these wonderful horses. I continue to read on their history, for no matter how much I learn I find I am still in the dark..lol. I have 4 grey’s and two bays all from exceptional lines. I can honestly say I have never riden a more intelligent horse that was so willing and in tune with their rider..
Verify the location where the coach has been produced.